LA's Pzazz label was owned by veteran New Orleans band leader Paul Gayten, who, like so many other Crescent City musicians, had left the city in the 60s for fresher pastures when the major labels had deserted Louisiana and session work grew so much harder to find. Over a couple of pretty intense years from 1968 Gayten issued about 50 singles and a few LPs. The musical range of this output was vast from jump blues (Louis Jordan) through jazzy instrumentals (Warm Exclusion, Soul Machine) through to soul and funk which made up the bulk of the recordings. I'm afraid that a lot of it was pretty run of the mill stuff but there were some real gems like this obscurity from Johnnie Ruth King. 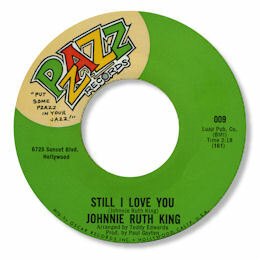 Still I Love You is a lovely waltz time ballad full of nice touches like the paino fills and the sensitive horn charts. Johnnie Ruth gives the lyric the full treatment and makes the whole sound come together nicely.